Few things say ‘Green’ to customers as openly as having solar panels across your roof. Why not use the hot Alice Springs sun to generate energy for your home? A quality renewable industrial solar system is highly efficient and can be paid off in a short amount of time. Cartwright & Sun Energy can also provide fast and reliable electrical services across Alice Springs. 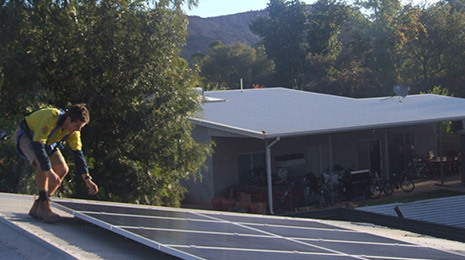 Why not use the hot Alice Springs sun to generate clean, renewable energy for your home? Fast and reliable electrical services, dedicated to providing the highest quality customer service. We design every job to suit site specifics and customer needs, don’t hesitate to get in touch with us for a quote.